Re: Amherstburg asks Windsor to make an offer on regional policing, by Trevor Wilhelm, Dec. 7. Mayor Drew Dilkens believes Windsor can outdo the OPP in effectiveness and save Amherstburg money. But will it save the approximate $1 million that the OPP model would save the taxpayers? I doubt it, especially given that regional police services have considered and/or obtained OPP costings and the majority of police services in the province do have OPP provide policing services. According to OPP estimates, municipalities with and without contracts save on average anywhere from 35 per cent to 60 per cent by using the OPP instead of having their own police forces — figures reported by the auditor general of Ontario. For many years, the OPP communications system was in effect countywide. Rather than take advantage of their system, Amherstburg paid for LaSalle’s, then Leamington’s and then back to LaSalle’s dispatching when Leamington switched to OPP policing. If Windsor and Amherstburg police combined services, it would be an amalgamation of two services, not a regional policing model. Regardless, Amherstburg would have to incur the expense, once again, for another new communications system since, at this point, Windsor and Amherstburg’s communication systems are incompatible. The Records Management System of the two policing services is also incompatible. Windsor does not use the NICHE system that OPP, Amherstburg and most other police services use. Amherstburg taxpayers have long supported a police department hierarchy unparalleled by similar-sized OPP detachments and regardless of whether a community decides on an amalgamated service or a regional policing model that extra financial burden will continue. Amherstburg need only look to the experience and savings its neighbouring communities enjoy by opting for the OPP policing option. 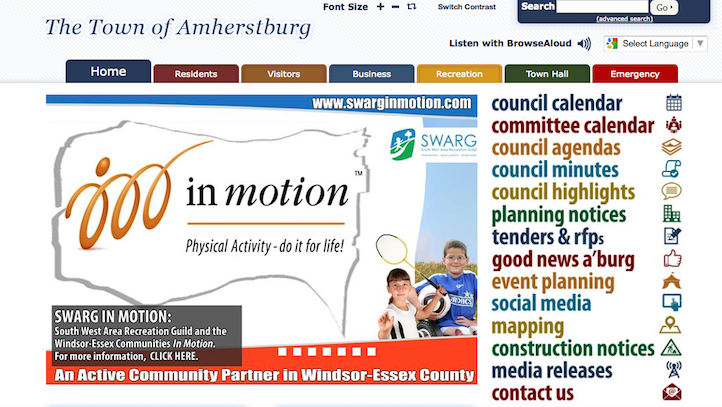 After speculation, debate and what might be confusing to some, today is the public information meeting on the proposed 2016 budget for Amherstburg from 2 to 4 at the Libro Centre. Mary Caton, The Windsor Star reported the change in time. Ron Giofu, River Town Times, reported that “town council has agreed to commit $49,972 in the 2015 budget on a nuisance control program to help combat the ongoing mosquito problem in the Fraserville neighbourhood. The nuisance program is over and above the larviciding program offered in conjunction with the Windsor-Essex County Health Unit. This was a question for the candidates to the burg watch during the 2014 election campaign; of those elected, Mayor Aldo DiCarlo, Deputy Mayor DiPasquale and Councillor Pouget responded that they supported the program. Revised dates, as posted on the town’s website, which is still difficult to navigate and still has accessibility issues, are set out below.